Parque natural como privado 1. 3 ac para que usted se extienda con el bádminton, el bocci o el croquet, con 450 'del lago accesible en el lago soleado de Shuswap. Su propio muelle de 60 'largo, boya y fogata están incluidos. 3 bdrm 2 baño casa que duerme 8 con retirada. Esta propiedad está ubicada en la ensenada protegida al comienzo de Magna Bay, donde abundan hermosos animales y vida silvestre. 2018 es la gran carrera de Sockeye Salmon y sorprendentemente aparecen en nuestro muelle. Si usted pasa su día en una tumbona relajante en la cubierta, tomar el sol o nadar en el muelle, jugando en el patio o disfrutar de su barco en nuestro agua shuswap cristalina, más tarde se encontrará caer en un sueño de ensueño en uno de Nuestras acogedoras camas. Estamos ubicados a 4 minutos en coche de una tienda de la esquina y tienda de licores, así como tiendas de ropa y alquiler de juguetes de agua, a 11 minutos en coche a la base de Crowfoot Mtn para diversión en vehículos todo terreno y hay muchas rutas de senderismo en la zona. Tenemos un montón de espacio de estacionamiento para usted y todos sus juguetes. El Celista Estate Winery ofrece visitas regulares y está a sólo 5 minutos en coche. Scotch Creek con supermercado lleno, farmacia y otros servicios, incluyendo un puerto deportivo de servicio completo es de 12 minutos en coche. No se olvide que siempre puede barco a la tienda flotante y Shark Shack bar flotante sólo hasta el lago en el estrecho sólo un paseo en barco de 25 minutos o tomar un paseo y disfrutar de nuestro lago y las hermosas vistas. Envíeme una consulta y luego podremos hablar ya que su reserva no se confirmará hasta que hablemos. What a great location and fantastic views. Denise and Kory were there to meet us upon arrival and got us all settled in. The house was nice, clean and served our needs all though most time was spent on the patio or the dock. The Magna Bay is a great spot too as it is a bit sheltered from rougher waters and we found less busy than other locations around the lake. We had no issues tying up our boat at the dock over night all there is a mooring buoy to tie off as well. There is also plenty of amenities within short drive as well farmers markets for fresh local food. We would definitely go back. Our family of 6 (4 teenagers) stayed at this vacation property for one week in August 2017. The vacation property had everything we needed and was SPOTLESS upon arrival. The 3 bedrooms were a good size and there was a surprise walk-in closet in the master bedroom. The house is well equipped, tastefully decorated and well presented visually. There is a large deck overlooking the water with very comfortable lounge chairs and eating table. The path to the beach was well lit at night out to the well thought out fire pit and large private dock where we moored our boat. Magna Bay is a nicely protected bay for boat owners and wake boarders. The very friendly owners came regularly through the week to water and maintain the very large yard. 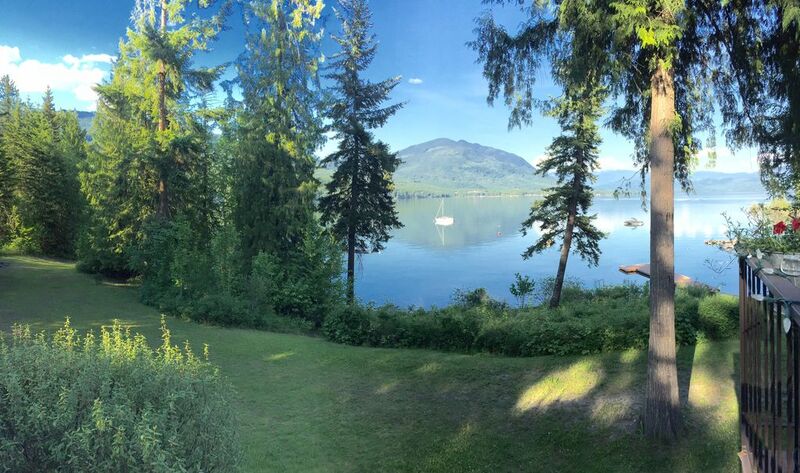 I would recommend this vacation rental for those who are boat owners and want to explore the Shuswap Lake or for those who just want to enjoy a private well taken care of beach vacation property. Thanks Jane for your review. It is so nice to hear that you appreciated our hard work to make our home clean and welcoming to you. We are so glad you and the kids enjoyed yourselves. Denise and Cory are excellent communicators and keep an incredible home. the property exceeded expectations. the bay provides shelter from the wind and I always felt comfortable leaving my boat on dock which is easily large enough to accommodate 3 large boats. We are so happy your group enjoyed themselves. It is nice to see people who enjoy boating so much and know the lake well, feel safe and secure at our dock and property. Thanks for the compliment. Check in is 4:00 pm and check out is 11:00 am. This is a non smoking property. No pets allowed. No events allowed. VRBO charges us a credit card fee of 5% which we must pass on to you but there is another option of paying electronically which is not charge for.